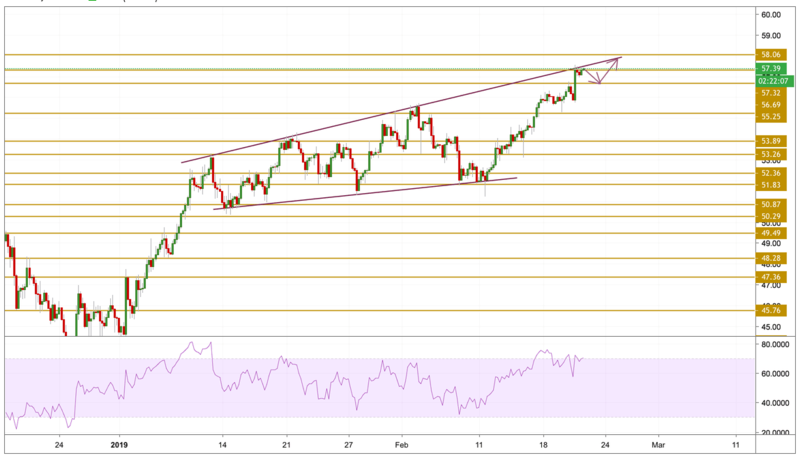 After surging to a new high of $57.55 per barrel, Crude prices retreated moderately after the American Petroleum Institute released its weekly crude oil stock data. The weekly release of API crude oil inventory surprised with an increase of 1.260M versus -0.998M registered last-week renewing supply-glut fears amongst energy traders. In addition, the arrival of China’s Vice Premier Liu He to Washington in order to discuss future trade ties with US diplomats, also had an effect on oil prices. The reason is that China is on the top of the list of the world’s largest crude consumer and its trade spat with the US has so far challenged global growth. Traders also will be focusing later today on the official reading of the US stock change from the Energy Information Administration. Crude oil prices continued to edge higher during yesterday's session as expected, printing new highs at $57.55 per barrel. The prices are still holding on top, but the momentum seems to be slowing down with different divergences with the price. That is why we expect a small correction towards near support levels or a consolidation before we see another surge. The main level we will be focusing on is the $56.69 support level.